This is the primary data entry screen that coaches see. 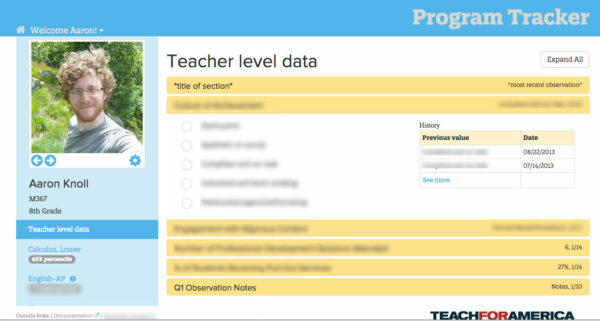 Historical data displayed to the right helped coaches understand the story of a teacher in regards to that one data point; while the quick overview at left with the teacher’s picture enabled a high level view of where a teacher was at that moment. I worked with a researcher who collected information on coaching practice through contextual study. I worked with that researcher to translate study findings into a fully interactive prototype which we were able to pilot with coaches. I worked closely with business analysts and business partners to test the product, and with software developers to fully implement the flows from the prototype. In the process, I also worked within the marketing team’s new brand guidelines to design a new set of visual design patterns for internal Teach For America business applications. I did: interaction design, high-fidelity prototyping and visual design. 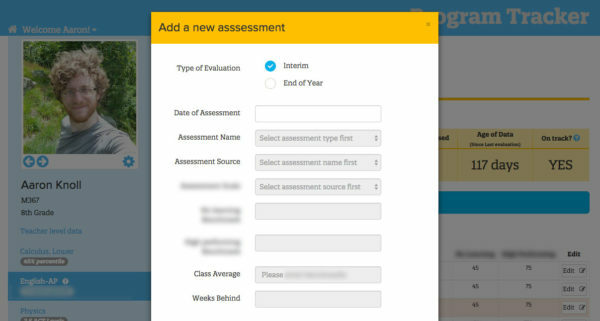 Tracking assessment information was one of the most complex data entry points that coaches were responsible for. With lots of complex dependencies and room for error, these forms were designed with a series of forcing mechanisms within the interface itself so that it was nearly impossible to enter the wrong data. For a long time the Compliance Tracker was built to simulate the spreadsheets that coaches informally used to track information. Study of coaching practice revealed that while spreadsheets optimized redundant data entry tasks, the barrier to capturing live data was actually that the spreadsheet was misaligned with the coach’s mental model. Rather than a compliance task, coaches viewed these data points as “the story of a person.” More important than the snapshot of an entire group of teacher’s was a snapshot of a person’s story over their time in the classroom. By a simple calculation of “clicks,” it took more mouse clicks to enter the same data. But when evaluated through sentiment, Compliance Tracker helped radically change the user sentiment about these compliance tasks. Instead of something that “I have to do,” coaches began to talk about compliance data points in the same way they talked about skill progress data points. We saw marked improvements in data quality, data coverage, and overall user satisfaction nearly immediately and in subsequent month over month and year over year evaluations. 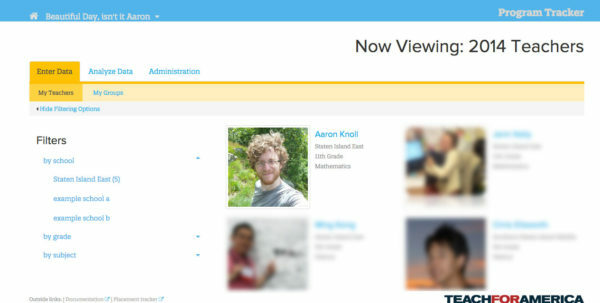 When coaches log in, this is the “person centered” view they see. All of their teachers’ faces are visible. For coaching managers, the filtering controls at left slide in and allow them to show/hide coaches, for example, to only see coaches at the school they’re travelling to today. This view was foundational in that it helped the users see data entry as a task that was about people more than compliance.